To send a test message marketing campaign, click New campaign in the Marketing menu. 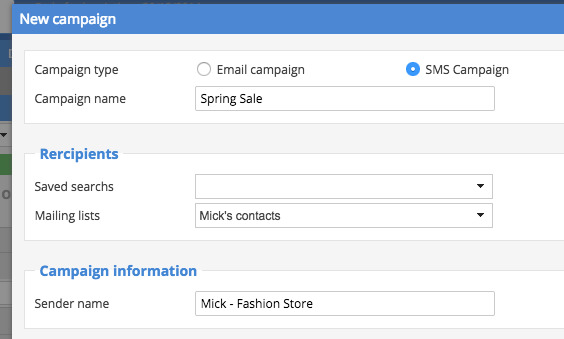 In the window that appears, choose the SMS campaign option. All you have to do then is to name the campaign, to choose the recipients (lists and / or segments) and give the name of the sender (which will appear on the recipient's phone). This done, simply fill in your message (max. 160 characters). Save and you'll be redirected to the campaign overview. You can then send a test of your campaign by clicking Send a preview. If you are satisfied with the test, you can either send the campaign or schedule it in the future.